Flayed and Displayed is a participatory public performance deployed with multiple large-scale architectural projections, a mobile green-screen recording studio, two lead artists and 2-4 volunteer performers who interact with the public. The immersive projections create an animated virtual spaces on surrounding building, walls and city monuments. The projected content consists of real-time animations based on historical material described below, and live cinematic drawing. This work investigates the relationship between two complex systems: first, the human body and its range of microbial foes and inhabitants; second, the medical-practice-and-insurance industry complex. The performance employs a sequence of participatory activities facilitated by trained volunteer performers. Each step represents a stage of a patient’s engagement with the medicine-insurance complex (from symptom discovery, to diagnosis, to treatment, and sometimes death). A networked audio-visual system captures live video and introduces interactive animated elements at each step, and adds these elements to the panoramic architectural projection. Audience members engage in an immersive and interactive media experience imbued with medical terminology and a mix of contemporary and historical imagery, and by engaging in conversation with the performers about past experiences with the medicine-insurance-complex, we create a space for multifaceted rumination on health, sickness, suffering, death and healing, and the ways in which our notions of health and healing are influenced by politics, technology, and capitalism. This work is aesthetically inspired by imagery in pictorial anatomy and physiology texts from the 15th-18th centuries. 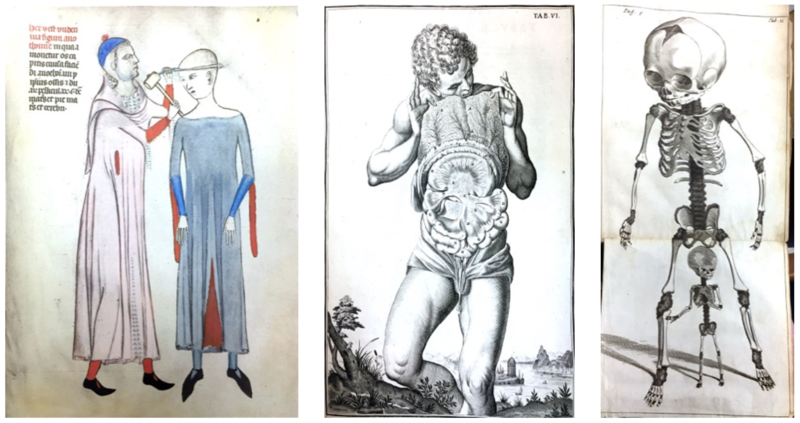 These artifacts represent a time when art and science were inseparable; texts employ advanced and intricate print technologies to produce detailed, stylized and evocative images, as well as poetically detailed depictions of micro-organisms. The texts also mellifluously mix fact and fiction to depict and describe phenomena invisible to the human eye. We are working in conjunction with The University of Minnesota’s Wangensteen Biomedical Library and Librarian Lois Hendrickson and sources digitized through Internet Archives. For several years, Momeni has been developing technologies and creating performances that transform still images and drawings into live animation. These systems allow such projection performances to integrate live video feeds captured during the course of the performance, and to have interactive elements within the projections that are controlled by audience members. During the summer of 2015, Momeni’s lab (ArtFab) created Dranimate: an interactive animation system that allows users to rapidly and intuitively rig and control animations based on a still image or drawing, using freehand gestures (see Dranimation demo here). Using Dranimate, complex animated scenes composed of dozens of individual elements can be constructed in only a few minutes (see Complex Animation Example here). Momeni and his students have already experimented with large-scale outdoor projections using Dranimate (see Live Outdoor example here), and will be giving two public performances for the VIA Festival and H3O//003 during September and October of 2015. For Medical Madness, Momeni will make extensive use of Dranimate. The experiments Momeni has already performed in applying Dranimation to medical imagery show tremendous expressive potential in the way gestures bring these images to life (see Anatomy Example here).